Open-Source Software for robots is a de-facto standard in academia, and its advantages can benefit industrial applications as well. 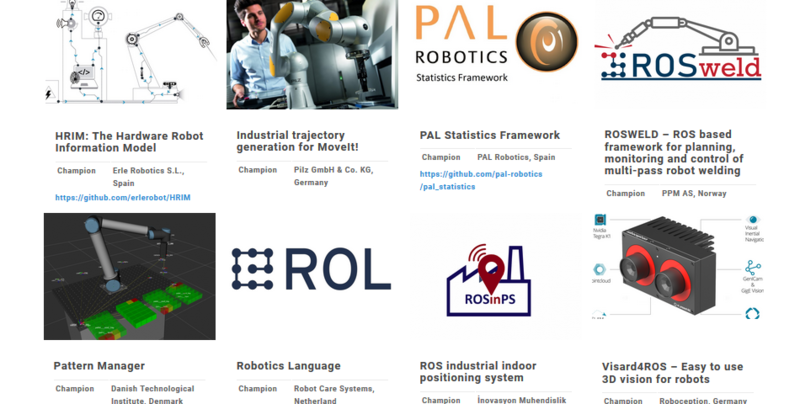 The worldwide ROS-Industrial initiative has been using ROS, the Robot Operating System, to this end. In order to consolidate Europe’s expertise in advanced manufacturing, the H2020 project ROSIN supports EU’s strong role within ROS-Industrial. It will achieve this goal through three main actions on ROS: ensuring industrial-grade software quality; promoting new business-relevant applications through so-called Focused Technical Projects (FTPs); supporting educational activities for students and industry professionals on the one side conducting ROS-I trainings as well as and MOOCs and on the other hand by supporting education at third parties via Education Projects (EPs). Now it is easier to get an overview of first results from ROSIN at http://rosin-project.eu/results. Browse through vendor-developed ROS drivers for industrial hardware, generic ROS frameworks for industrial applications and model based tooling. Thanks to ROSIN support, all of these new ROS components are open-sourced for the benefit of the ROS-Industrial community. Each entry leads to a minipage that is maintained by the FTP champion, so check back often for updates on the progress of the projects. The project is continuously accepting FTP project proposals to advance open-source robot software. New incoming proposals are evaluated every 3 months (approximately). The next cut-off dates will be 14. September and 16. November 2018. Further calls can be expected throughout the project runtime (January 2017 – December 2020).